Aloe vera has a long history of use, both as a cosmetic and medicinal herb. It’s said that Egyptian queens Cleopatra and Nefertiti used it as part of their regular beauty regimes. Alexander the Great and Christopher Columbus used it to treat soldiers’ wounds. This desert plant is native to Arabia but now grows wild in many countries with dry and sunny climate. And because aloe vera is so popular as a natural healer, it’s widely cultivated for cosmetic and medicinal use. As many people think, aloe vera is not a cactus. It belongs to the lily family, and hence it’s also called as lily of the desert. In Sanskrit it’s called ghrita kumari; ‘ghrita’ means gel and ‘kumari’ means young woman—so basically a gel that keeps you looking young and vibrant. The aloe vera plant is a succulent and grows about one to two feet tall. It has no stem – just broad, thick fleshy leaves, with spikes along the edges. The leaves are green to grey-green in colour. And it’s within these leaves resides the gel packed with many health and beauty benefits. Not only does it nourish the body from within – aiding digestion, boosting immune function and healing wounds – but it can also be used topically to enhance the beauty of your face and hair. 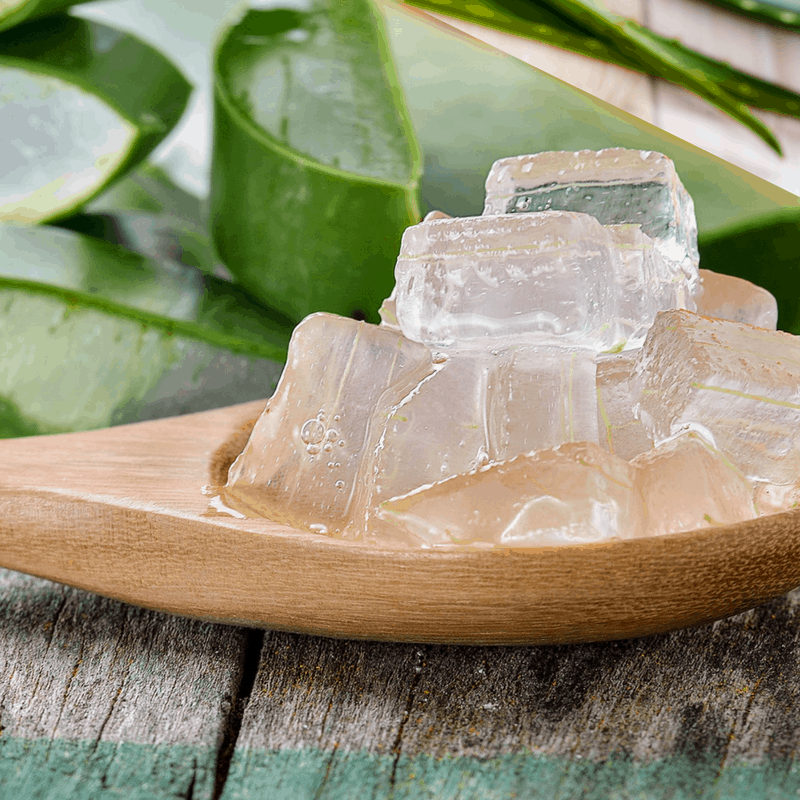 Aloe vera has also sparked interest in the scientific community, and researchers are just beginning to unlock the benefits of this wonder plant. Before we see ‘why’ and ‘how’ to use aloe vera for your natural health and beauty needs, let’s briefly take a look at what’s in the aloe gel…. Aloe vera is an incredibly nutrient-rich plant. Its gel contains over 75 active components which encourage healing and rejuvenation of all the body systems. Vitamins A, C, and E – all these are powerful antioxidants. Plus, it contains folic acid, vitamin B12 (maybe) and choline. Minerals such as calcium, chromium, copper, selenium, manganese, magnesium, potassium, sodium and zinc. It contains 8 enzymes: They help to break down sugars and fats from food and thus improve digestion and absorption of nutrients. Some of them also help to reduce inflammation when applied on the skin topically. Sugars, such as monosaccharides (glucose and fructose) and polysaccharides. They contain anti-allergic and anti-inflammatory properties. It provides 12 anthraquinones, which are known as laxatives. Among these are aloin and emodin, which acts as analgesics, antivirals and antibacterials. Four fatty acids (or plant sterols) are present. They have anti-inflammatory and antiseptic properties. It contains 2 hormones called auxins and gibberellins. They help with wound healing and have anti-inflammatory effect. Aloe vera contain 20 of the 22 human required amino acids. Amino acids help build protein in our body. Others: Aloe also contains salicylic acids which have anti-inflammatory and anti-bacterial properties. Saponins that are the soapy substances form about 3% of the gel and have cleansing and antiseptic properties. Lignins enhances the absorption of aloe vera when applied on the skin. Aloe vera has multiple uses in teeth and gum issues. Some studies claim that aloe vera gel may be better than the commercial toothpastes at controlling cavity-causing oral bacteria. Plus, aloe is extremely useful for gum diseases like gingivitis and periodontitis. Because of its antiseptic and antifungal effect, it also helps provide relief from mouth ulcers, cold sores and other oral issues. All you have to do is use aloe vera as a mouthwash and swish for a minute or two. 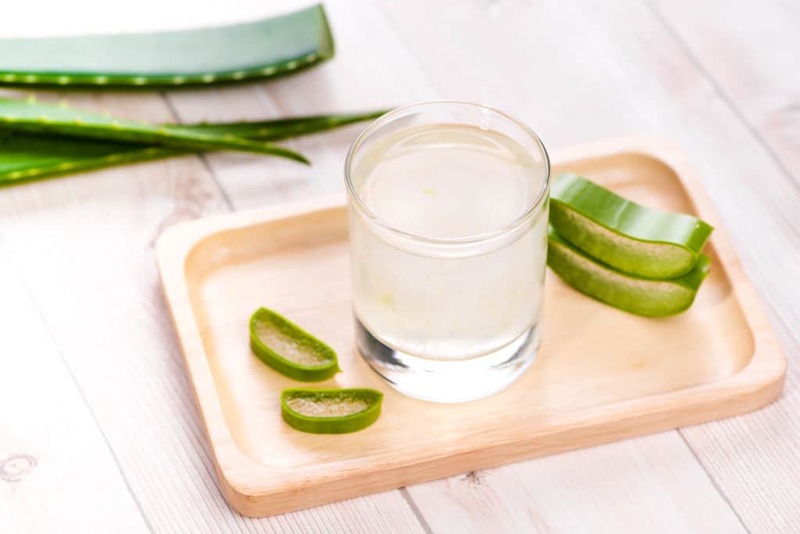 Drinking a tablespoon full of aloe vera juice twice a day can cause blood sugar levels to fall in people with diabetes, according to a study in Phytomedicine. There are also multiple animal studies and anecdotal evidence that support the use of aloe in diabetes. But if you have diabetes, take aloe juice under guidance of your doctor or dietitian. Aloe vera gel is a great natural remedy to treat psoriasis. An older study from 1996 found that applying aloe vera gel was a more effective for psoriasis than the placebo cream. The cure rate in the aloe vera group was 83% and only 7% in the placebo group. Apart from topical application, you can also drink aloe juice. When taken internally, aloe can help detoxify your body. Accumulation of toxins affect the skin’s health and leads to the development of conditions like psoriasis and eczema. With cooling and anti-inflammatory properties, aloe vera gel is the perfect remedy for sunburned skin. It reduces skin redness and replenishes lost moisture of the skin. You can also apply aloe gel before sun exposure, as it absorbs UV light and may protect the skin from sun damage. Aloe vera gel may also bring relief from radiation dermatitis. Aloe vera gel can beat any anti-aging cream in the market. The beauty of aloe vera is that it can soak into the skin really deep and provides a natural barrier that shields the skin cells from outside pollution and sun. Aloe vera stimulates the production of collagen and elastin fibers, making the skin more elastic and less wrinkled. The amino acids in aloe also soften hardened skin cells, while zinc helps to minimize pore size. Plus, aloe is very moisturizing and it will leave your skin soft, smooth and hydrated. Tip: Mix two drop of almond oil with aloe gel and use as face moituriser. 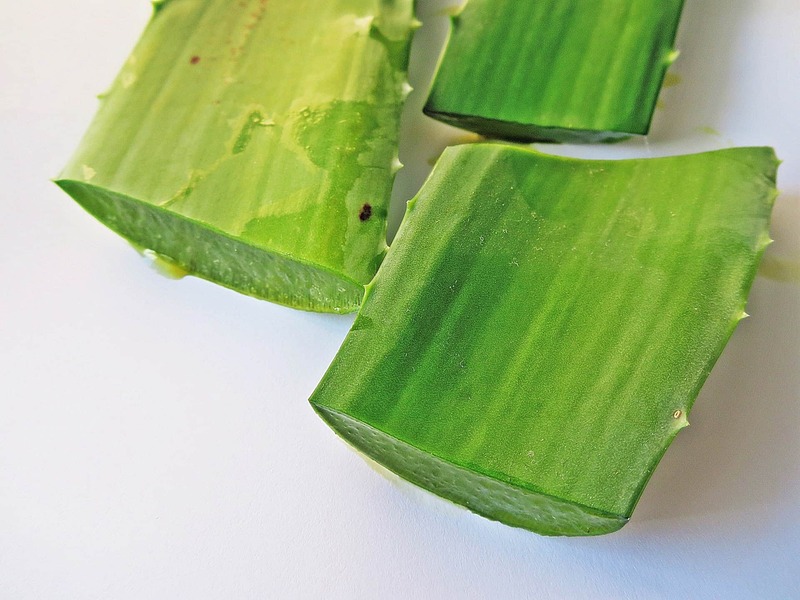 Aloe vera can quickly shrink the acne, thanks to its powerful anti-inflammatory and antibacterial properties. But that’s not the end of the story. Aloe vera speeds up the growth of new cells and allows the skin to heal fast, with minimal scarring. Aloe also helps to fade the acne scars and other blemishes and even out your complexion, making your face smooth and flawless. Aloe vera is commonly used as a topical treatment for scrapes, cuts, burns and other wounds – and for a good reason. The two hormones in aloe vera stimulates the activity and proliferation of fibroblast, which in turn increases collagen content. Due to this, the wound heals and contracts faster. Aloe vera is amazing for your gut health and is said to restore normal digestion. This healing gel works on several levels. The polysaccharides soothe the irritated gut lining by creating a protective layer. While the alkalizing effect of aloe bring quick relief from acidity and stomach upsets. Aloe vera is anti-inflammatory and it is shown to benefit people from stomach ulcers and IBS. It also lessens yeast formation, encourages healthy gut bacteria and regularize bowel movement. A healthy digestive tract is very important as it is where all the vitamin and nutrients are absorbed — from the food we eat. Aloe vera is very good in building up the immune system without causing allergic reactions or side effects. It’s anti-inflammatory, antiseptic and antimicrobial effects act as great defences against foreign pathogens like bacteria and virus. Aloe vera may also help fighting against the body’s own cells that have changed due to an illness, for example cancerous cells. In an animal study, certain substance in aloe vera was found to trigger an immune attack that resulted in necrosis and regression of cancerous cells. Aloe vera gets rid of toxic substances in multiple ways. The anti-fungal, antibacterial and antiviral effects of aloe vera remove the harmful pathogens from our body. The slimy aloe juice also absorbs toxins and renders them inactive by binding with them. Plus, the juice heals the gut as well as encourages the growth of good bacteria. Thus, making your gut super healthy and balanced and ready to detox your system from toxins. Note: Aloe vera is also fantastic for Hair. It can help Promote Healthy Growth as well as Reduce Hair Loss. I have talked about it here. I have a little aloe vera farm in my house. The good part of growing aloe vera is that it’s a very low maintenance plant. It just needs a little water (like twice a week) and some sunshine and it will grow happily. But just don’t over-water, it will go floppy and die. If you live in colder climates, it will only survive if you keep it indoor. But keeping aloe vera in your house is to your advantage. It is known to purify the room air and process all the toxins. Isn’t that amazing? Aloe vera comes in many varieties so it’s important that you pick the right one. 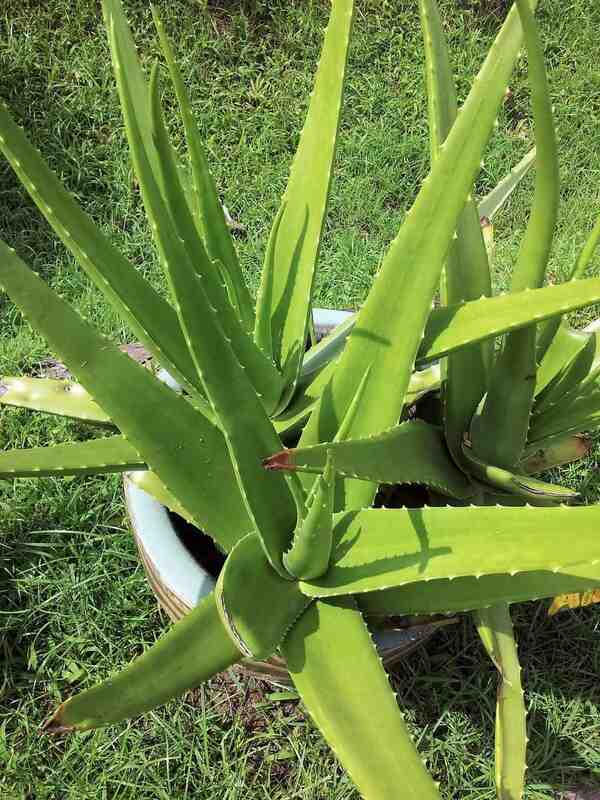 Look for aloe vera Barbadensis-miller – it is the most potent one with many medicinal properties. Why should you make aloe juice at home? So you know what goes into it. No fillers, no additives, colors, preservatives or thickeners, just pure aloe juice. As natural as it can get. Freshly extracted juice contains many phytochemicals and nutrients, which may lose their potency if the juice is kept for longer time. And it’s such an easy growing plant that you will never run out of it. Step 1: You can start by cutting a couple of outer leaves (outer leaves are more mature and ripe for use). Remember to cut close to the base. Step 2: Keep it aside to allow the yellow sap to ooze out completely (it will take a few minutes). Or you may want to include the yellow liquid – which functions as laxative and is often used as a natural constipation relief remedy. (but do not include the yellow sap in skin and hair preparation as it can cause irritation). Step 3: Wash the leaf. Trim the spiky edges of the leaf. Next place it the flat side up and remove off the top skin. Scoop out the clear pulp with a spoon. Step 4: You can eat the aloe straight away – it is almost tasteless, just a little slimy. Step 5: If you want to make a juice – place the aloe pulp in blender and blend until smooth. Alternatively you can also grate the pulp using a cheese grater. Also, you don’t have to use the entire leaf in one go, use a small piece of leaf at a time and keep the remaining in the fridge, it will stay good for couple of weeks. 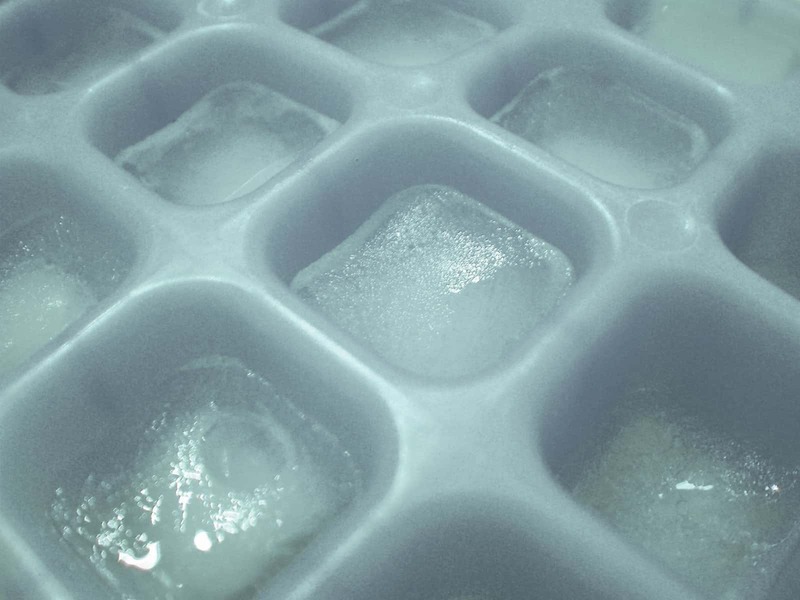 But if you decide to make a large batch of aloe gel, you can freeze it for later use. You are only suppose to eat/drink a very small quantity – like 2 to 3 teaspoon every other day. Don’t drink too much as it can cause unwanted effects like increase in dryness and roughness in your body (vata symptoms). So even if it has tons of nutrients, don’t go overboard. It’s best to take aloe vera juice on an empty stomach, so first thing in the morning or before your meals. Note: Pregnant women and young children should not take aloe vera internally. As always, it is best to consult with your doctor before starting any long term herbal remedy. Do you use aloe vera to enhance your health and beauty? Surjushe A, Vasani R, Saple DG. Aloe Vera: A short review. Indian Journal of Dermatology. 2008;53(4):163-166. Hello and thanks for the great article. I have one lonely aloe plant but now that I see all the wonderful things it can do I will buy more so I can have my own little aloe vera Farm. I suffer with Lyme disease the past 40 years. The doctors did not check me for it until 2014. They thought I had fibromialgia. My lyme doctor says I need to alkalinize my body. So I will take the aloe vera juice for that. I also was recently diagnosed with hypothyroid which has a lot of the same symptoms as Lyme disease but also causes my hair to thin at the temples and on top and my eyebrows as well. So I am very excited to see if taking the juice every other day will improve these symptoms. Hi Heather, thanks for reading. I am so glad you are finding it useful. My sister has hypothyroid and she does a weekly egg masks</a and it has helped a lot with hair loss and also makes her hair shiny and vibrant. Thank you for the link to egg mask, it looks promising for increased body. About a month ago, I purchased Aloe Vera from the health food store. I take 2 tbsp. in the morning just before I eat. Within a week, my hair stopped falling out. Growing up, I had alopecia. I hope this stops it from happening again. I noticed yesterday that a certain area on my scalp shows new hair growth. Thank goodness. Aloe is that good!! Interesting, i just bought a couple of Aloe Veras for about a week ago. Now i will have some good use of them 😉 if i manage to not over-water them this time! Gotta thank you for all the inspiration you give! Thanks for your kind words Luna. Do let us know how aloe works for you. I got plants in my backyard﻿, I need to make some use of it.